During 2016-2017, Rocky Mountain Tribal Leaders Council is working with the Indian Health Service to arrange tribal consultation meetings and health committee meetings to ensure effective consultation and participation by and between the federal government, Tribal governments, Tribal organizations, state agencies, and other service providers on the development of IHS program policies and activities. This includes assisting in the coordination of conference calls for the Tribes and urban programs. We also coordinate with IHS to assist in identifying Tribal leaders and Tribal officials to attend committee meetings relating to the Federal Advisory Committee Act (FACA), health workgroups, and other committees. 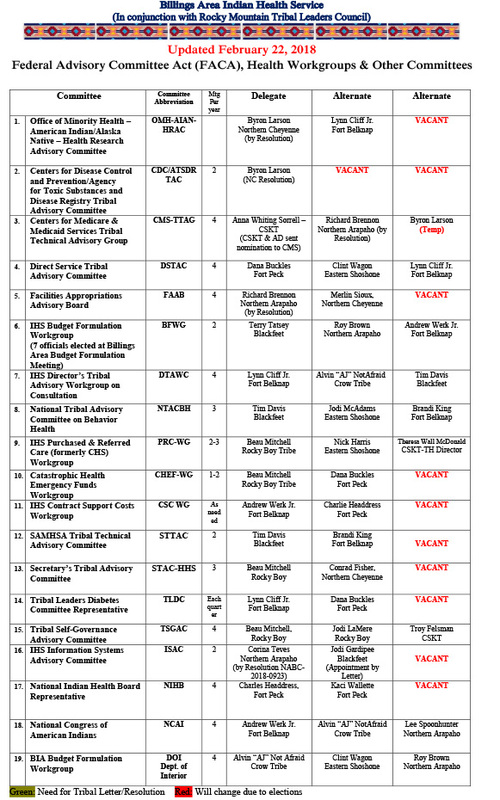 We work to keep the Tribes updated on the development of these committees – you can view the FACA and other committees’ information below, as well as important “Dear Tribal Leader” letters and consultation notices. 10/27/2016: The Indian Health Service has recently updated its Contract Support Costs (CSC) policy. It has been 10 years since the last CSC policy update. IHS will now apply the medical inflation rate to calculate estimated annual increases to ongoing direct CSC. This provides Tribes with additional access to resources. Also, new updates to the CSC policy mean that Tribes can reconcile and dtermine the full, final CSC expenditures within 90 days of the end of the annual performance period. In addition, the policy includes new tools, such as the CSC Negotiation Template, which provides a way to calculate CSC consistently and in a transparent manner. Please click here to download the entire Dear Tribal Leader Letter as well as the new Contract Support Cost policy. Click here to download a handout from the May 2017 IHS DSTAC Quarterly Meeting regarding budget line item 128. Please see the list below for current (February 22, 2018) delegates, alternates, and vacancies on various committees which RMTLC helps to coordinate. Click here to download a PDF of the current list. The abuse of prescription and non-prescription opioids is rampant across the globe. This collection aims to highlight various issues within the subject of opiate abuse, with articles focused on opiate abuse in young people, opiate rehabilitation, illegal vs. legal opiate abuse, and dual diagnosis of opiate abuse and mental health. These articles will be available for free until May 31, 2017. Please click here to access the 65 free articles.